From the manufacturer (Hallmark): "Realism! Action! Excitement!" You and your Lionel trains are a one-man railroad empire!" With this dramatic introduction to its 1939 catalog, Lionel once again demonstrated its dedication to producing elaborate scale models of the most popular trains of the day. "Speedlined by Otto Kohler," the Hiawatha locomotive featured gleaming wings across its nose and a colorful paint scheme that accentuated its length. Running the hotly contested Chicago-Twin Cities route, the Hiawatha outpaced its predecessors with its more powerful class F-7 Hudson steam engine. 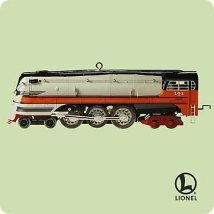 If you have any questions about this product by Lionel, contact us by completing and submitting the form below. If you are looking for a specif part number, please include it with your message.